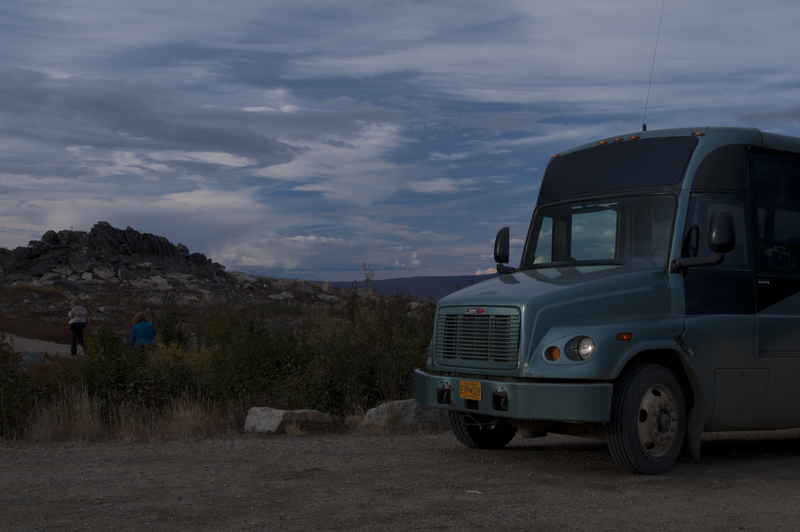 The rolling tundra stretches on for miles and the tour coaches’ diesel engine rattles. We stop for a twenty minute break so the visitors to Alaska can see the first real stretch of tundra they’ll encounter today. 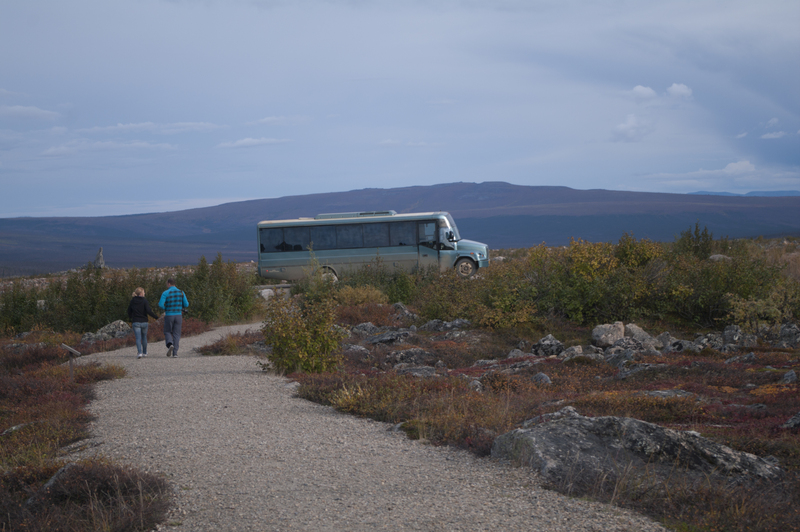 The dozen people I am shepherding to the Arctic Circle on this fourteen hour tour spread out down the small quarter mile path to the promontory which looks out over a red and gold autumn patchwork of short shrubs. I will not go to the viewpoint with them. It was raining south of the Yukon River today. The mud on the Dalton Highway splatters onto the windows like flecks of mustard and stains my clothes just as much. Soon, I’ll have to buy new khaki pants at the thrift store. I stand on tiptoe and use a ten foot long squeegee to wash the mud from the windows so my guests can see the scrubby forests, distant mountains and various rivers we cross on the way to the arctic circle. Most of my guests are over 60, retired, and in various states of health. After washing the windows, I dump another bag of Hershey’s Nuggets into a picked over candy basket and leave it near the door as people start to filter back. Some can’t stay on their feet very long. Today is a rare, meteorologically speaking. The wind isn’t as strong as it usually is up here. People don’t have to yell at one another as the wind rustles the guest’s rain jackets and knocks on nearby birch branches. I go back outside to enjoy the overcast but calm day. A group of people who were complete strangers until their cruise began a week ago are conversing. They talk about their finances. I can’t tell if this is bragging or just friendly conversation. One couple are retired teachers and were able to retire early. One took half of every one of his paychecks and invested it in the money market. Someone laments selling Apple stock in the early 80s. The woman standing next to me has frizzy gray hair. She holds a coffee mug and her finger joints protrude a little like my grandmother’s but she’s still fit and active. She’s one of the former teachers. She turns to me and says, “Make sure you travel while you are young.” I smile and nod, but I’m thinking, who’s going to pay for it? I use a credit card to buy gas and groceries. Eventually I’ll hit my credit limit. *I’m 27 and though I work year round, this job does not have employee health or retirement benefits. I don’t own any stocks. I could find a job that has benefits, but I’d probably have to leave the state, and the industry, I love. Sometimes it’s hard for me to watch people my parent’s and grandparent’s age on vacations. I know the “haves” earned their homes, their yearly vacations, their retirements, their second homes, but I wonder if I will ever have the things they do. Or will I, like some of my other “have-not” guests, walk with difficulty, pause out of breath at the top stair of the coach, and save money for years in order to go on one last vacation to a dream location? It’s a reminder that as humans live longer, we have to prepare for anything. Further, good health can’t always be bought and many times medical conditions are not under our control. You might think many Millennials would despair about the future, but most of us don’t. For better or worse, we think it will all work out. We assume the economy will get better. We assume medical advances will keep us healthier longer, even if we have to work longer than our parents did before retirement. Some of us assume we will never get tired of working since we take jobs that we enjoy, even if the pay is low. It seems like we have a long time to fix social security, it seems like we have a long time to start saving for retirement, it seems like things will get better. Only time will tell. We get back on the tour bus and I continue to our next stop where I roll out the red carpet at the arctic circle and hand each person a certificate as they cross it. I excuse myself while everyone takes photos so I can serve up celebratory cake and ice cream. It’s a long day, we have seven more hours back to town, but it’s worth it. My guests have enjoyed an experience few people receive. Many will never be in Alaska again and I get to live and work here. Now I just hope a few of them tip me. *This episode took place several years ago. I am now at a different job and in different financial bracket now, but it’s interesting to look back. ← Toughest, and Funnest, Pet?